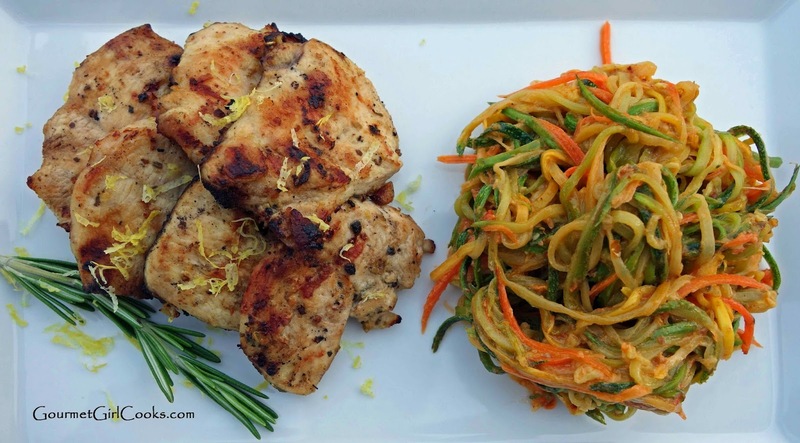 Using a julienne peeler, Spirelli or spiral vegetable slicer, cut zucchini, squash and carrot into pasta strands. Spread pasta out on several paper towels and sprinkle evenly with salt (about 1/4 teaspoon or so). Cover with another layer of paper towels and gently press to help blot juices and liquid from the pasta. Let sit for about 10 to 15 minutes; change paper towels and lightly sprinkle with salt again. Let sit an additional 10 to 15 minutes. Press gently extracting as much liquid as possible. Heat olive oil in a nonstick skillet over medium-high heat. Saute veggie pasta for about 4 or 5 minutes, stirring frequently, just until al dente; reduce heat to low-medium. In a small bowl, whisk cream and sun-dried tomato pesto together; pour over veggie pasta in skillet and toss with a rubber spatula until lightly coated (add additional cream, if necessary). Sprinkle grated Parmesan over top and toss until heated through and cheese melts into sauce. Serve immediately. Makes approximately 3 to 4 servings.